Stephen Crowley/The New York Times You might think U.S Treasury officials would love a new kind of financial instrument that helps Americans save more. And you would be wrong. “Who Could Say No to a ‘No-Lose Lottery’?”: Prize-Linked Savings plans work all over the world. But in the U.S., they have some powerful foes. What do saving accounts, college degrees, and the death penalty have in common? That’s the question we ask in our latest podcast, “Who Could Say No to a “No-Lose Lottery? '” (You can download/subscribe at iTunes, get the RSS feed, read the transcript, or listen live via the link in box at right.) It’s a followup to our previous episode, “Is America Ready for a No-Lose Lottery?” The answer to that latter question is: not quite. The “no-lose lottery” we’re talking about is a Prize-Linked Savings (PLS) plan, a financial instrument that has flourished in many countries around the world for many years. A PLS is typically a bank savings account (though sometimes a government bond program) that pools some of the interest from all depositors and pays out big cash lottery prizes on a regular basis. It combines the thrill of the lottery with the safety of a savings account. The idea is to encourage people to save money rather than blow it on the lottery, where the expected payouts are typically very poor — but which, admittedly, is a lot more fun than simply putting money in a savings account. You’ll hear from two economists, Peter Tufano and Melissa Kearney, who think PLS plans present a good solution to the U.S.’s sad savings rate. The PLS idea has finally taken root in the U.S., albeit in very small measures. 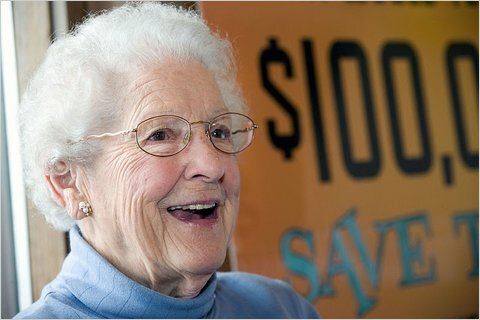 One state, Michigan, now has a PLS program called “Save to Win” that has awarded its first $100,000 prize — to an 87-year-old woman who won it after depositing $75 in her credit-union savings account. You’ll hear from her too. And you’ll also hear from some of the people who aren’t such big fans of PLS. State lottery directors, for instance. This isn’t very surprising. State lotteries are big moneymakers, turning a annual profit of $17.9 billion on $58.8 billion of ticket sales. So a lottery-linked savings plan could be seen as a natural rival. In South Africa, a massively successful bank-run PLS plan was shut down after being sued by the National Lotteries Board. In the podcast, you’ll hear from state lottery directors Gordon Medenica of New York (the biggest lottery in the country) and Leo DiBenigno of Florida. We also talked to Michael S. Barr, who until a few days ago was the Assistant Secretary for Financial Institutions for the U.S. Treasury. (We interviewed him before his departure was announced.) He has done a lot of notable academic research about making financial services accessible to low- and moderate-income households. My first question to him in the podcast was whether he plays the lottery himself. No, Barr said. Why not? 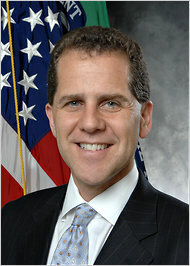 Department of Treasury Michael S. Barr. So the story of PLS isn’t just your average “you-can’t-fight-City-Hall” story. It’s more like an “even-City-Hall-can’t-fight-a-revenue-juggernaut-like-the-state-lotteries” story. As for the question about savings accounts, college degrees, and the death penalty — it has to do with hyperbolic discounting, though you’ll have to listen to the episode for this to make sense. For the full impact, I suggest dressing up Washington D.C. with a whole lot of neon, showgirls and low-cost buffets. Given Levitt's questioning of the thanking issue, just tell him it's a "Freeconomics Radio" podcast. Oh, and the listeners do thank you for the podcast (and it probably sells a few books, too). If a young worker were to take the 12% or so of wages taken from his paycheck for Social Security premiums and place them instead on any bet for just one spin of the Roulette Wheel, once per month, investing the proceeds in the S&P 500, he would retire at age 67 a multimillionaire. If he died beforehand, his heirs would get the millions. If he died decades later, his heirs would still inherit a bundle. As it is, a worker who dies before retirement loses all his SS benefits (unless he has an indolent spouse or minor children). Black men are almost guaranteed to lose, since their life expectancy is now about 69. Social security represents a strong transfer of wealth from rich to poor, from singles to married, from the childfree to the breeders and from Blacks and Hispanics to Whites. And paying the monthly premiums to the gummint is a hell of a lot less fun than spinning the Roulette Wheel. This must mean that interest rates for individual PLS savings accounts is uncompetitive with regular "high yield accounts" since the PLS winnings are taken from the accrued interest. I'll stick with the sure payment instead. I would agree with the plan to do this except that I have nothing but hatred for the us financial industry. They are crooked and rotten to the core and will simply extract your money until they have it all and you and your children are their slaves. Black men have a life expectancy of about 69 because of high infant mortality, i.e. well before paying anything into Social Security. The idea that they "lose" or that Social Security is absurd. I know he's speaking off the cuff, but Barr's rhetoric is pretty lame. "a fight one doesn't have to pick" would by definition NOT be "something that's absolutely essential" - and "wage INTO a discussion" is convoluting "wade into" with simply "wage". It shows how, when governments sanction gambling, they lose their moral standing. Predictable! The PLS not quite a no lose lottery. Sure, it is different from the real lottery, where you lose actual money if you don't win. Of course, in a PLS, you don't lose any actual money if you don't win. But you could be losing in effect. Saving for tomorrow always constitutes a certain loss of consumption today. But even that isn't the loss per se. It could be that the reason you weren't saving in the first place is that you value your gain in consumption tomorrow less than your loss in consumption today. Thus, if you don't win the PLS lottery, you are have still effectively "lost" by saving money you would otherwise have preferred to spend, since you put it in the bank account just to enter the lottery. The biggest problem with these programs in the US would actually be that many of the people who play the lottery do not have savings accounts because the government seizes their money. I understand why there is an interest in seizing funds to cover back taxes and child support; however, these public policies create cultural norms where people dont put money in banks. Its a huge problem and these lotteries wouldnt address this critical underlying issue. Its a very real example of the law of unintended consequences. I wonder what the true economic impact of these policies is from the loss of real wealth given the lack of investment. This doesnt even contemplate the even more troublesome problem of cash checking and money wiring services which actively prey on this same population. Math fail. A Roulette wheel as a built in house advantage, so consistently playing it will have one result: losing money to the casino. Your plan would work better if they skipped the wheel and just invested the money. Of course your plan assumes that the S and P, or any investment, is a certainty for when someone wants to retire. Imagine the catastrophe for those who had their retirements wholly dependent on the markets in recent years. The only sure thing I know of is Government Bonds, which is exactly where all that SS money has been all these years. Turns out a deep recession and credit freeze did a pretty good job of "encouraging" people to save. Sorry, Jimbino, the odds at roulette are not in your favor. The odds on having any proceeds for a single number in Vegas are 1/38, while the payout is 36:1,leaving you behind the 8-ball, as it were. When you can convince me that the wealthy (of whom I know many) got that way without the support of the poor etc, I will support eliminating Social Security, and not one minute before. Please explain why you describe the U.S.'s savings rate as "sad." What is the optimum savings rate? Why should we put money in a bank where it earns no interest and loses value due to inflation? It sounds like the term "breeder" is used as a slur, to degrade people who make choices different than yours. It attempts to cast "these people" as somehow less than human, rather than people who are experiencing different things than you. It's sad to see this disrespect for others' dignity. I do hope this word will eventually be recognized as the hate speech that it is, and people would be ashamed to blithely toss it into their comments. The financial industry is stealing the people's savings. I hate to do business with any banks, insurance companies, or stock brokers anymore. You must misunderstand Social Security. It's also there for survivor and disability insurance not just old-age benefits. FWIW, some sound financial advice would be to skip the roulette wheel. Just invest it. I haven't played the numbers since the Mafia ran the operation. They were a better risk, had better odds, and didn't report your winnings to the IRS. I always find it interesting that when I was young, the cops regularly rounded up the neighborhood bookies and tossed them in the slammer. The reason most often given for the government's hatred of bookies was that they "took advantage of the poor," who should have been putting their money into savings account rather than gambling it away. That was, of course, until the government got into the business. NYC started OTB (the only bookie joint in history ever to lose money), and the State got into the numbers racket via the lottery. Suddenly, enticing the poor to spend their meager earnings on gambling was no longer considered exploitation. In fact, it was heavily promoted by the same government that had persecuted the bookies. That the government was more corrupt than the Mafia was a given then, as it is now. But we did think they could run a lottery on the up-and-up, it being so profitable an endeavor to begin with. Unfortunately, we were wrong. The New York State Lottery was shut down for a while in the 1970's due to a corruption scandal. Many winning tickets were never sold on the public market, thus proving that gambling with the Mafia really was a safer bet. I literally get sick to my stomach when I'm waiting on line to pay for something at a local deli, 7-11, or bodega, and the line of poor people wasting what little money they have on the false dream of the lottery snakes its way out the door. What a shame. The state really should be ashamed of itself. In their endless quest for revenue, they've become no better than racketeers and mobsters. Worse, actually, because the state actively promotes their exploitation of the poor. At least the Mafia kept it under wraps. I don't understand most of the comments here, but I'll say that PLS is a terrific idea and it would take off here in America. It would be of tremendous benefit to regular lotto players to maintain even a small savings account. State lottos are a farce. Sure, they bring in some revenue, but they are also for-profit enterprises that pray on human weaknesses. And, of course, they absorb money mostly from low-income folks. Money spent on lotto does virtually nothing for the economy, whereas savings accounts are a great thing. Perhaps if interest rates ever go back up, then PLS wouldn't be as attractive, though it would still encourage people to save, and only some of the interest needs to go to the prize. So, corrupt state officials and lotto vultures should get out of the way and see how the market reacts.